... an extension for debug Mono applications with Visual Studio. Develop with Visual Studio, and compile against the Mono Framework. You can decide, with MSBuild or also with XBuild – and everything fully integrated into the IDE. Debug local, or debug remote on any device which is supporting Mono. Use the full power as usual of Microsoft Visual Studio. Use your loved extension, and gain the performance during development with Microsoft Visual Studio if you have to target Mono. Download MDebug, install it, lets code! Create Mono Projects within Microsoft Visual Studio or convert your existing projects and start immediantly to debug your application. With the MDebug Extension you are capable of developing Mono applications with the power of the most used Integrated Development Environment you love: Microsoft Visual Studio. Mix the power of the cross-plattform Mono plattform and the power you are used to with Microsoft Visual Studio - MDebug is the bridge between them! Sign up for an acccount here, and download the trial version of MDebug and give it a try! 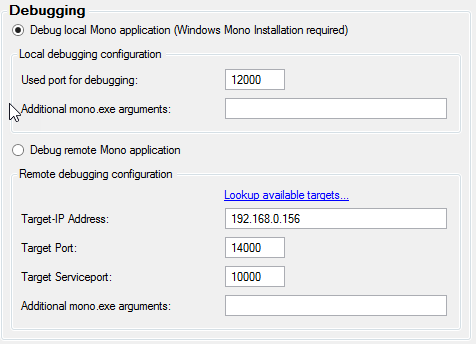 Develop your Mono applications despite if you want to debug locally or on a remote target like an embedded device. You have the choise with MDebug - developg against the big, mature Microsoft .NET Framework, run it within the Mono environment or use the Mono Profile! Because MDebug is integrating full into Microsoft Visual Studio you have the power of any extension you love to use within the environment. We do not care about language, if you use C# or VB.NET you always have the choice! Use the well integrated debug environment of Microsoft Visual Studio together with MDebug. Inspect locals, threads, breakpoints - it is supported! With MDebug you are able to deploy the application local on your machine, debug it on your machine with a local Mono installation, or you can deploy the application for testing on any device which supports Mono. If you want to develop a application for multiple platforms, MDebug is the tool which supports you on any Desktopsystem. With MDebug you can develop, debug, test and deploy the application on any device which supports Mono.